Yesterday President Funes announced he has appointed Ricardo Perdomo to be the new Minister of Justice and Security and Rigoberto Pleités as the new director of the National Civil Police (PNC, in Spanish). He also announced that Francisco Salinas will now head the State Intelligence Organization (OIE, in Spanish), and that David Munguía Payés, his former Minister of Justice and Security, as his security adviser. The changes come after the Constitutional Court’s recent decision that Munguía Payés (former Minister of Justice Security) and Francisco Salinas (former Director of the PNC) were ineligible for their posts due to their military careers. Justice and Security Minister Perdomo is an economist and political scientist, and in January 2012 President Funes appointed him as the Director of the OIE. These are not Perdomo’s first government positions. He held several posts in the Durarte Administration (1984-1989) including the President’s Private Secretary, President of ANDA, Minister of Economics, and the President of the Elections Council. Before being assigned as the new Director of the PNC, Rigoberto Pleités was the Director General of Migration and Foreigners, a post he accepted in January 2012. Director Pleités is an electrical engineer and has a master’s degree in business administration. He has also served as the Director of Human Development at the Ministry of Education. During his announcement, President Funes said that Perdomo “ought to continue with the work begun to reduce crime in the country over the last ten months of his administration.” He similarly said that as the new director of police, Pleités “should continue the assignment of modernizing the police force with an emphasis on reducing the amount of extortion and organized crime, particularly related to drug trafficking. President Funes also said that while he did not agree with the Constitutional Court’s decision that Payés and Salinas were disqualified from holding their positions due to their affiliation with the military, it was his obligation to comply with the order. Last Friday we posted about the CEL hosting a medical clinic in the Lower Lempa and a community organizing a protest about the October floods. Our staff visited both events and we have a few more details. Thursday night of last week, the CEL (the public/private corporation that manages the country’s hydroelectric dams) arrived in La Canoa (a.k.a. Comunidad Ocatavio Ortiz) and set up tents for the medical brigade, which was held on Friday. Word of the clinic spread pretty quickly and many in the region considered it to be an attempt to pacify those who blamed the CEL for the October flooding, and generate good will in the region. When the CEL arrived at the clinic on Friday morning to finish setting up, they wanted to take the banner down, but the a community representative would not allow it. According to locals, turnout was low. Even though people are in need of the services and medicines they did not want to take them from the CEL. When it became evident that turnout would be low, the CEL sent a truck around the communities advertising the clinic, but the turnout was underwhelming. The communities’ response to the clinic was also somewhat underwhelming. As much anger and frustration among people throughout the region, the banner that hung across the road was the only form of protest at the clinic site. 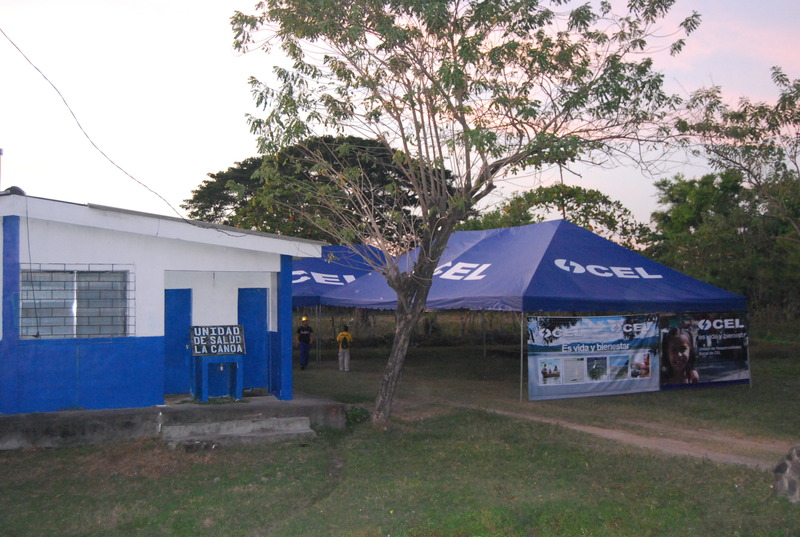 In fact, the community board in La Canoa approved the CEL using the clinic; some members of the board even took advantage of the clinic’s services. Since we posted on Friday, we also learned more about the military presence in the clinic. Giving the military the benefit of doubt, the local Ombudsman for Human Rights said that the military was probably there to continue supporting people in the region. They had, after all, been an integral part of the rescue effort during the October floods. A community member, however, approached one of the soldiers and asked why the military was there. He answered quite frankly that they were “providing security.” When pushed on who had given them orders to provide the CEL with security, the soldier seemed to realize that he had said too much and stopped answering questions. The Salvadoran constitution is clear that the military is prohibited from engaging in domestic issues unless it is a national crisis. Rescuing residents from the worst flooding in the nation’s history arguably falls into the category of national crisis, while providing protection for the CEL likely does not. The Ombudsman and other government agencies should investigate the use of the Military. 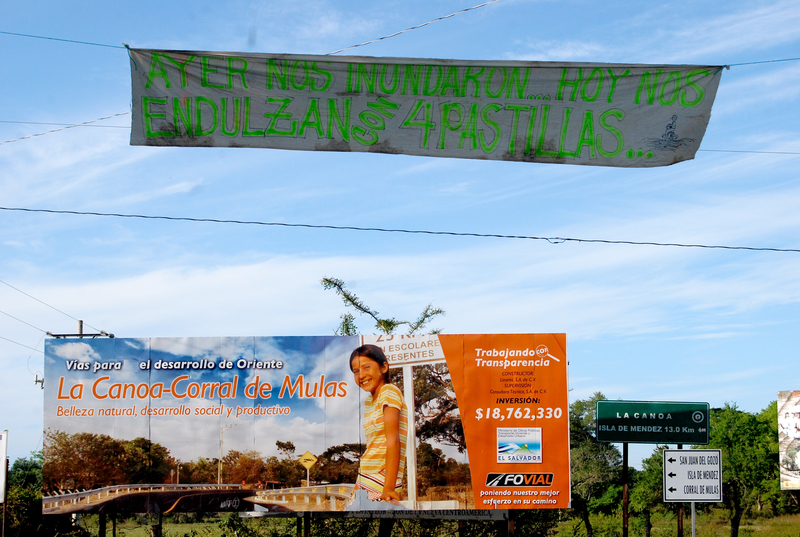 Though the banner was the only form of protest in La Canoa, sources clarified that the protest on the bridge in San Marcos de Lempa was a direct response to the medical clinic and the CEL’s apparent attempt to pacify those upset about the floods. Residents of Nuevo Amanecer took over the bridge on the main highway, shutting down the main corridor that traverses the southern coast of El Salvador to show that they could not be bought off. More than a couple protesters commented that they were disappointed that residents allowed the clinic to open in La Canoa without more protests. Protesters made only a couple broad demands during the two hours they had the highway closed down. They want the CEL and government to help them rebuild their lives and prevent more flooding in the future. And they wanted to send a clear signal that they would not be bought off. In a speech to the legislative assembly on June 1st, President Mauricio Funes provided commentary on his second year in office and proposed goals for improvement of the country’s state of security. Notable among these proposals is Funes’ plan to create a system of obligatory military service for youth at risk of being recruited, or targeted by gangs. If enacted, those deemed to be “at risk”, a denomination given at the discretion of the National Civil Police, would be required to complete a total of 2 years of military training without weapons (6 months), civil protection training, rehabilitation, and vocational training aimed to shape them into productive citizens. Funes believes that removing an estimated 5,000 at-risk members of society off of the streets and putting them through this program will resolve many of the country’s security issues caused by the prevalence and entrenchment of violent gangs in Salvadoran society. While Funes’ introduction of the plan was only general, with details and logistics to be decided upon at a later date, some of the infrastructure necessary to implement it is already in place: the Salvadoran Constitution stipulates obligatory military service for citizens age 18-30, although this provision (designated as a “dead letter” rule) is not implemented The caveat is that recruiting minors is of the essence to the success of the plan; FBI statistics show that gangs often target middle and high school students for recruitment, who range from approximately 12-18 years of age. The program would theoretically need to work with at-risk youth before they join the gangs. These statistics and the need to recruit minors may necessitate some legal revisions. However, “youth” in El Salvador includes both minors and young adults, so it is unclear as to whether he plans on targeting minors, or if the participants would be over 18. Funes’ plan, while controversial, does have proponents. Aída Santos, the former director of the National Public Security Council, in her interview with El Faro applauded Funes’ plan, citing that many adolescent members of gangs often feel like prisoners who cannot escape the constant threats and harassment they experience as gang members. She believes that military training will provide them with this escape, as well as the sense of community and support they may have been seeking to find through gang membership. Those opposed to Funes’ plan for obligatory military service for at risk youth argue that the program will only serve to exacerbate gang violence, as when adolescents are recruited into the program, it is highly likely they will already be associated with a gang. This would effectively mean that the Salvadoran government would be training gang members and possibly providing them with resources and connections within the government. There are already reports of the police and the military being corrupt and having connections with organized crime and gang activity; this could have the potential to intensify that problem. Others opposed to the plan make claims that it will violate human rights. Henry Fino of the Human Rights Institute at the Central American University (IDHUCA), also in an El Faro interview alleged that Funes’ proposed use of the army is unconstitutional, as the army is only meant to intervene in matters of public security in extreme cases. He believes that the prevention of crime is not an extreme circumstance, nor does he even consider it to be a matter of public security. In addition, as Funes’ plan to impose obligatory military service on youth continues to develop and does, in fact, include minors, the President must be careful not to violate his treaty obligations under the Convention of the Rights of the Child (CRC). The CRC, which El Salvador signed and later ratified in July of 1990, provides rigid protection for the rights of minors, of the sort that Funes seeks to recruit. El Salvador also ratified an optional protocol to the CRC on the involvement of children in armed conflicts (A/RES/54/263) proposed in May of 2000 and signed and ratified by El Salvador by 2002. Article 2 of the protocol is explicit when it states, “States Parties shall ensure that persons who have not attained the age of 18 years are not compulsorily recruited into their armed forces.” The protocol in its third article also stipulates that any involvement of minors within the army must be “genuinely voluntary [and]…carried out with the informed consent of the person’s parents or legal guardians.” If Funes continues to pursue the development of such plan, he must be aware of his obligations to the international community and the scrutiny he will come under if he violates his treaty obligations. She applauds the administration for providing new social programs, financing agreements for the next five years, and his public apologies for such past crimes as the assassinations of Monseñor Romero in 1980 and the Jesuits in 1989. She also cautions readers of the importance of supporting his administration in the face of the current violence and public insecurity that has dominated the news in the past few weeks. This week’s headlines are evidence of this administration’s harried response. Funes has reacted to each mounting case of violence with bolder and more repressive measures. He deployed the military to work along side the civilian police soon after his inauguration. On June 1st of this year he announced that the military would also intervene in the prisons, which they rushed to implement after the Sunday bus massacre in Méjicanos. They are now partnering with Migration to patrol the un-manned border crossings, notorious for moving drugs, stolen vehicles, and undocumented people. In a widely distributed public announcement Funes says social and preventive programs are important for the long term, but repressive measures are necessary now. The Ministry of Public Security is expected to present a bill to the Legislative Assembly in the coming days to outlaw gang membership. During a press conference reporters asked how police would identify gang members. Henry Campos, the vice minister for public security responded “by tattoos and other types of evidence”. A law based on the same premise was declared unconstitutional in 2004. But Funes made a pointed demand from the Attorney General’s office during his June 23rd speech addressing the bus massacre – the same speech where he announced the new bill. The Attorney General’s office is an autonomous institution, and appointments come from the Legislative Assembly. The ex-attorney general Astor Escalante told the press on Monday that of the 100 homicide prosecutors, only 30% have actually received any training. The institution appoints prosecutors with very few requisites; there is no policy to recruit prosecutors who have actually won convictions. At the end of 2009 this group of elite homicide prosecutors had 16% conviction rate. Garrett is right to call for continued international support of a Funes administration battling violence and weak institutions with very few resources. That does not mean an acceptance of reactionary and repressive measures – often the most accessible means for the ‘commander in chief’. Funes needs public pressure to uphold ethical and progressive reforms more than ever; and he especially needs allies for strengthening institutions that he has little power to control. A couple days ago we posted an article on how violence and insecurity is gripping El Salvador, as exemplified on October 19, when a rumor of a gang uprising or riots was enough to impose a 6 pm curfew on San Salvador. Violence in El Salvador is much higher than it has been in previous years. The Salvadoran police are reporting 3,673 homicides so far in 2009, a 40% increase over the same period last year. If the allegations reported by Diario Co Latino are true, a few government officials could be responsible for stoking the violence and sense of insecurity in an attempt to destabilize the new Funes Administration. One or more police investigators allege in a letter that PCN Congressman Antonio Almendáriz has been working with police officials, government prosecutors, and judges in San Salvador to weaken the legal system and thereby allow the violence to continue. According to the plot, the new administration, which took office in June of this year, would appear as though they are unable to ensure security, and weaken their high-level of support with the Salvadoran people. The police investigators allege that four judges of the peace had united and declared that they were “against the system.” This was a particular problem for the police investigators who sought support from the judges in arresting those responsible for spreading the rumors of the supposed gang attack on October 19. The police managed to find other judges to work with and finally arrested twelve suspects who were in possession of hand grenades, firearms, and police uniforms. When in custody, the suspects said that a police official in Apopa, a municipality north of San Salvador known for its high levels of gang activity, gave them the arms and uniforms. The same police chief has strong ties to the four judges who declared themselves “against the system.” It remains unclear whether there was an actual gang uprising planned, or if it was a scare tactic that the Congressman, police, and judges had come up with. In a related story, the Associated Press, El Faro, Tim’s Blog, and others are reporting that the Funes administration has approved a plan to increase the military’s role in domestic security. For many years, the military has provided 1300 soldiers to help police patrol high crime areas. The Funes’ administration did not provide a specific number, but thousands more soldiers will join police in patrolling dangerous areas, searching for persons of interest, increasing security at prisons and youth rehabilitation centers, and other such tasks. The extra troops will support police in five of El Salvador’s departments – San Salvador, Sonsonate, La Libertad, Santa Ana, and San Miguel. Since the signing of the 1992 Peace Accords, the police are responsible for ensuring public security. According to the Constitution, the executive may only use the military for domestic security in extraordinary circumstances, and only with the approval of the Legislative Assembly. The plan will begin Friday, November 6, and in 180 days the administration will submit a report to the Legislative Assembly discussing the benefits of the program, and recommend whether or not the military ought to continue supporting the police. Though the majority of those living in San Salvador support the use of military in domestic security, many civil society organizations and the Church have expressed concerns that the use of military will result in more violence and human rights abuses (Tim’s Blog has posted several of their statements) . Their concerns are valid and ought to be carefully considered by the Funes Administration, Legislative Assembly, and people of El Salvador. Force is not a long-term solution to gang violence, as we learned with Tony Saca’s “super mano duro.” Gang violence is deeply rooted in economic and social inequalities that have plagued the country for generations. Real solutions require a long-term commitment to sustainable development that benefits all sectors of Salvadoran society. Such development will be impossible until stability and security is restored – if the military can help out while the police improve their ability to enforce the law, the Funes Administration may be justified in deploying them. Perhaps more importantly, sustainable development will be impossible until public servants put an end to the kind of partisanship that leads some to undermine the security and wellbeing of the people they are supposed to serve, in order to further their own cause.